Jared Unzipped: Naivety And Toothpaste. When I was a boy, I can remember fondly all the things that would widen my eyes. Taking the rare trip to the closest shopping mall an hour away was one such event. Even better, actually visiting a toy store was a massive deal -- it was like being allowed into heaven for just a few minutes. Even small things, which I now understand as mundane or ordinary, really brought a sense of awe into my life. Oddly enough, one example was toothpaste. Man... was I an innocent, naive kid. As a child, I vividly recall being quite observant of other peoples' homes. I would marvel at how big their VHS or record collection was. Did they have a recliner? Was their garage filled with junk or did they actually keep a car in there? Much less... what kind of toothpaste did they use? Much as little kids do, I'd usually ask to use the bathroom whenever my parents made social calls with friends and family. As I'd enter into the unknown void of a foreign toilet, my eyes would grow large. Wow... they have a fancy shower with real tile! Oh boy... their sink is clean and not covered with clutter! Look, they have towels that match... rad! And then, there was their toothpaste. 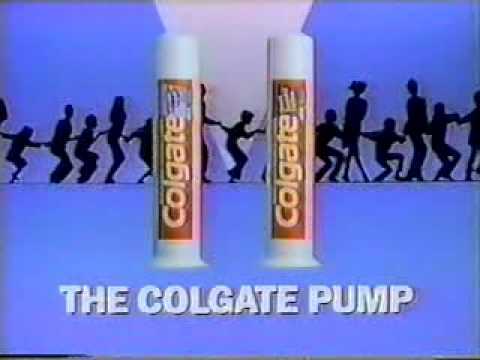 Remember when various brands started selling their toothpaste in pump canisters instead of tubes? It was a passing fad in the '80s and '90s. Two of the biggest brands that had special, more expensive versions of their toothpaste were Colgate and Aquafresh. Though, I'm sure there were others. Instead of the old fashioned toothpaste tubes that you had to roll up, these pumps wore the badge of elitism! They sat on your counter with a trigger on the top, which you'd push to squirt out toothpaste. No more man-handling a useless old tube, nuh-uh! These folks were living in the future where toothpaste was ejected in a civilized manner without any muss or fuss! When I saw that someone used pump-action toothpaste, I can remember feeling immediately impressed. Hey, I was a poor kid used to cleaning my teeth with cheap-o AIM toothpaste that cost a dollar. Pump-action Aquafresh was something only people with money bought. Holy cow... these people must be rich! Did I mention already how I was a naive kid?